In February I wrote about my blooming orchid, which had been flowering strongly since the previous October. Already, it was defying the normal orchid rules. Then, four months ago, I reported on the final three blooms defiantly and merrily taking the plant into its sixth month of flowering. My plan - as with any other orchid - was to wait until they too had died before cutting it back, moving it to a less sunny windowsill and waiting for new signs of life a few months later. But my orchid had other ideas! Shortly after my blogpost, and while the final flowers were still clinging on to one stalk, I noticed that the other one had begun to produce its first tentative bud. The three blooms became two, then one... the first bud became two, then three... the final flower eventually fell; the buds responded by swelling and adding to their number. For a few weeks it was a mass of buds, full of potential and promise, hope and new life... and then, in early June, the first bud slowly unfurled, stretched, basked in the early summer sun... and must have whispered encouragement to its companions, as within a short time it had plenty of company! Since then, unwearied by its exertions and undaunted in its orchid-rule defiance, it has simply gone from strength to strength. It's now so thickly abundant that it spills into the room, and in the evenings I can't draw the curtains around it, so that it would be neatly contained behind them. Instead, whilst half a dozen blossoms obediently press up to the window the rest cascade cheekily through the gap, as if determined to keep me company. 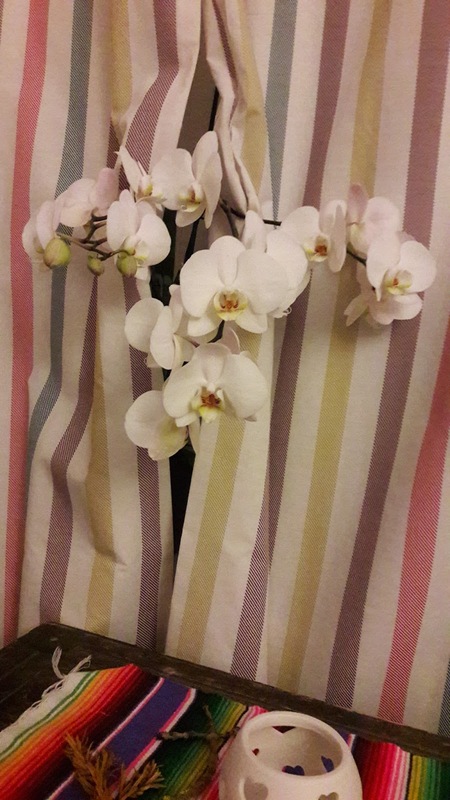 Luckily, this plant has always been positioned roughly halfway along the windowsill - as if in preparation for this moment - so I simply drape the curtains around it. But unlike my other plants, which are content to spend their days turned to the sun and their nights gazing at the moon and stars, this one clearly prefers indoor light and shadows. And so, like an over-familiar neighbour it pokes its way in: I look over, see this froth of oh-so innocent white brazenness and can't help smiling; if I listen carefully I can hear it, full of jovial bonhomie, announce its presence with a cheery Hello there... only me! And sometimes I wonder: what more rules will it break, and what surprises will this orchid spring on me next...?